Here's a photo-essay about a self-made person - one of many of our mountain residents who build on what they have, further their education and job skills one way or another. Klo built on the advantages - one of our project's sewing machines, and a short stint with a visitor one summer learning the basics up at Mon Bouton. With support from us and her spouse and family, Klo has just graduated from a Level 1 program at a state-certificated program in Darbonne (Dabon) - now just a 30 min. "commute" by moto down our newly built road from La Tournelle. Klo has 3 children; her Mom and older sisters are with us on Mon Bouton. 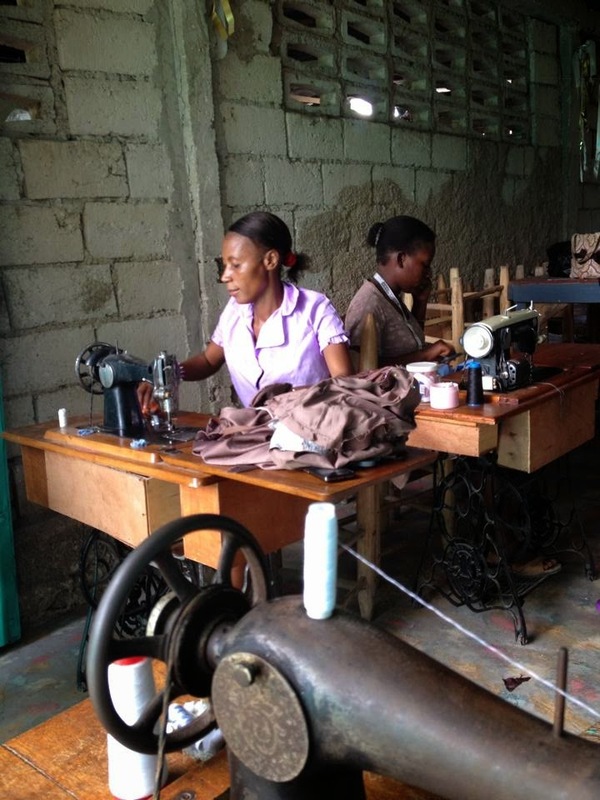 Klo hopes to hold training for others up in our mountain zone, and also make school uniforms and children's clothing. On the way to self-sufficiency, along with other entrepreneurs from Zorange zone, where grass doesn't grow under their feet! Ah, but...Indeed, there's a "but." All students have their garments dry-cleaned ! Yes, I know: dry-cleaned?! And the toll in trees - well, you can see it in this photo of Dabon's local dry cleaners. It's not only students' work that must be dry cleaned, it's all the other suits, wedding gowns and dresses that folks need here, just like anywhere else. But here is not like anywhere else. This is Haiti, where, as I wrote, grass doesn't grow under any feet, along with much else that doesn't grow here either. We need to bring on the jeans and t-shirt couture to rural Haiti, non?